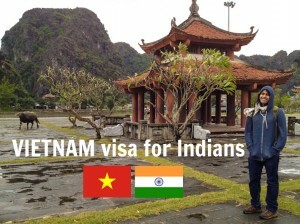 I just spent a month busing and biking down the beautiful country that is Vietnam. During that time I averaged around one bánh mì per day. This little sandwich is one of my favorite foods in the world and I was determined to find the best. 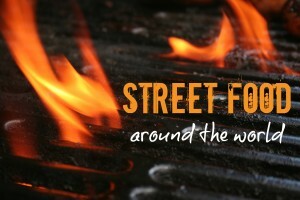 From street carts, to restaurants, to food stalls, I tried every type I could find. 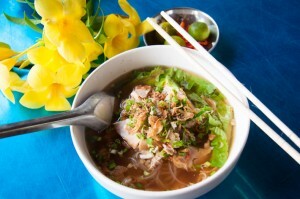 After all of searching, a tiny shop in Hoi An stands out as the finest. So why would I spend this much time looking for a sandwich? And what the heck is a bánh mì, anyway? This amazing little sandwich has only been around for a handful of decades. Starting in the late 1800s Vietnam was occupied by the French. Among many cultural influences, they brought with them their famous baguette. 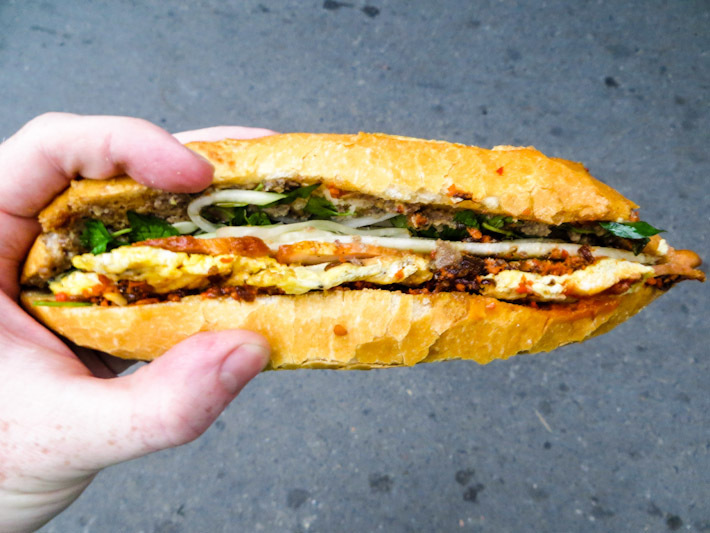 Initially the sandwich was made with French ingredients as fillings and it was called the bánh tay. 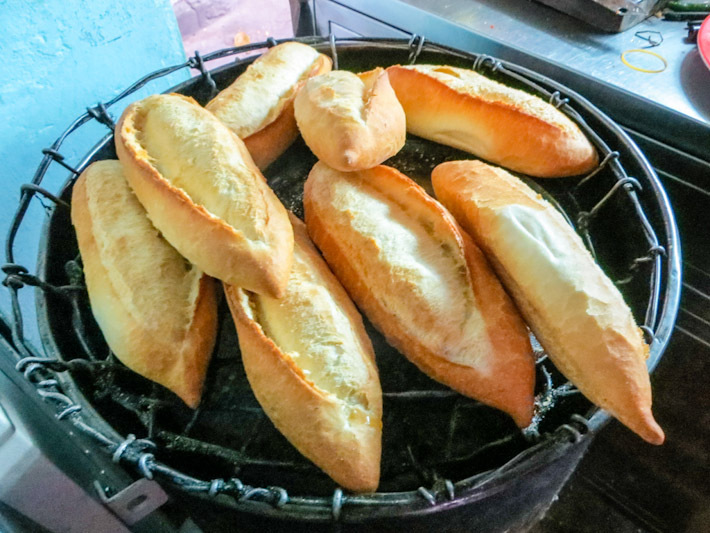 The French occupation ended in 1954 and soon after, the Vietnamese began changing the recipe and adding their own ingredients. 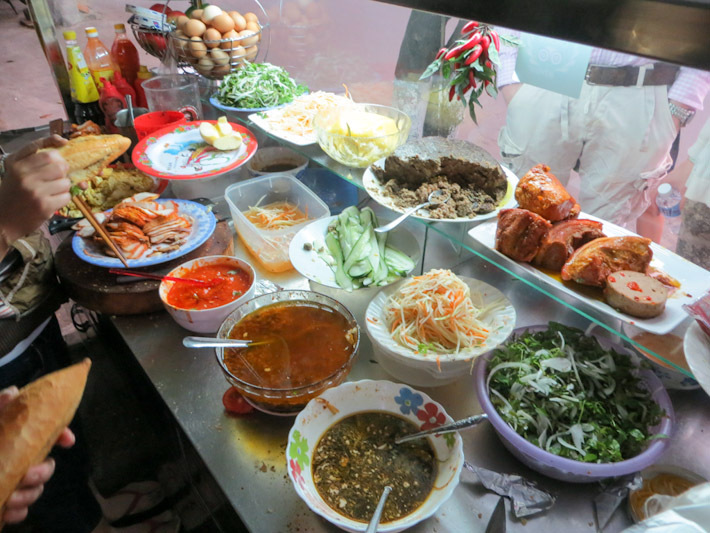 These included thinly sliced grilled meats, pickled vegetables, fresh herbs, chili sauce, and other local foods. 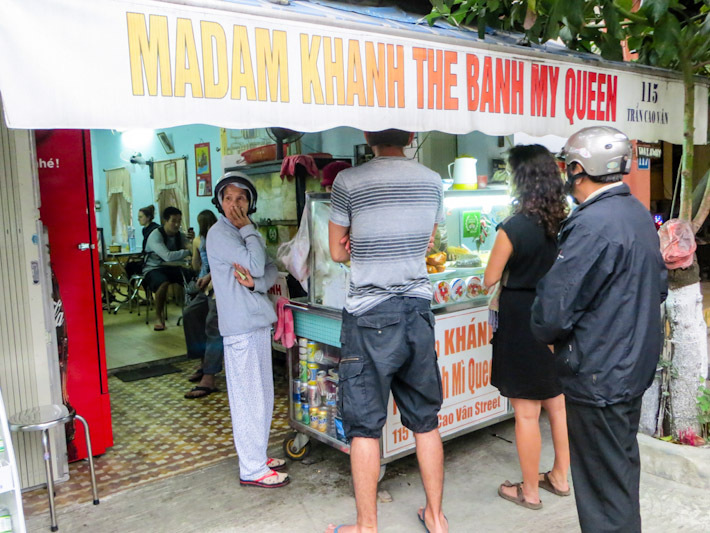 The name was changed to bánh mì which literally translates to ‘bread made from wheat’. This hybrid food was also a culture shift for the Vietnamese as it would mean a carbohydrate alternative to rice, which was previously a part of every meal. 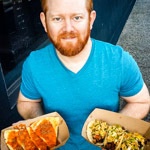 Thus, the bánh mì was born. I was led here by a friend who told me this was also Anthony Bourdain’s favorite. What can I say, Bourdain knows his stuff. Welcome to Madam Khanh’s! This local legend has been buttering up her delectable baguettes for 35 years she tells me in broken English. She gives me a big smile and seems appreciative of how happy I am to be there with her. There are a number of flavor combinations for the best bánh. Not only was Madam Khanh’s one the best, it also included the greatest number of ingredients I came across. It was also somehow the cheapest at a mere 20,000 dong (€0.82). After talking to Madam Khanh and recognizing the number of ingredients she puts into every bánh mì, I attempted to identify each one. Here’s a breakdown. Baguette: The most important ingredient is fresh baguette. Old and crumbly bread will make for a terrible sandwich, regardless of the other ingredients. Roasted Pork Belly: Roasted and sliced thin, pork belly adds wonderful fatty, smoky flavor. Egg: Cooked into a patty, this adds additional flavor. An egg seems to make just about everything taste better. Cilantro & Onion: Mixed together, these add a fresh herb flavor and an acidic kick. Vietnamese Mayo: A quick smear of Vietnamese mayo is another required ingredient in a great bánh mì, not everyone does this, though they should. Pork Pâté: Made in a sausage grinder, savory odds and ends pack even more flavor. Combined with the mayo, it’s flavor is reminiscent of head cheese and tastes wonderful. Veggies: Pickled radish and carrots add a slight crunch and some additional acid. Cucumbers add some crunch and acid as well. Fish Sauce: Found in just about every Vietnamese dish, this shouldn’t be a surprise. 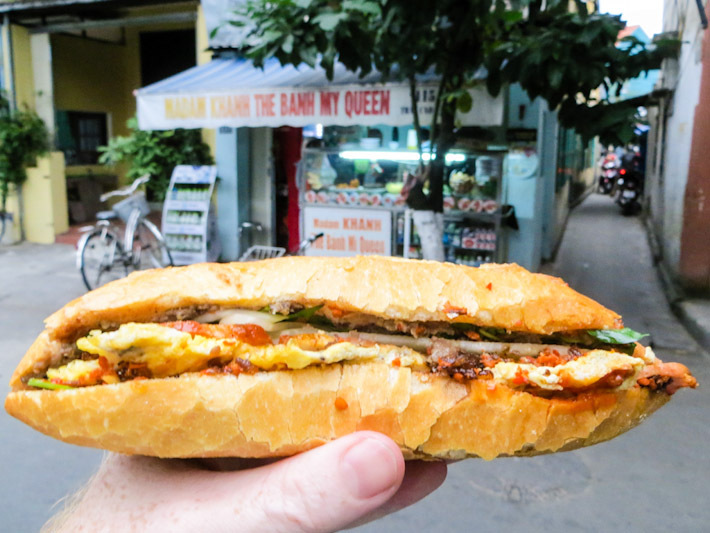 It isn’t in every bánh mì but they’re missing out. Meat Sauce: A special recipe made just for these meats, adding additional depth of flavor. Chili Sauce: Another ingredient found everywhere in this country. First a fresh baguette is heated to maximize crispiness. It is then cut open and smeared generously with mayo and pâté. The meat, veggies and herbs are then delicately laid inside. Sauces are then drizzled on top. Then she did something I didn’t see anyone else do – she put the sandwiches back on the grill to warm everything and further crisp the bread. She showed that this was a critical final component to the perfect bánh mì, and a step that is overlooked by most who make them. It took a few extra minutes but it has to be done to bring everything together. The extra time also allowed the sauces to be absorbed into the bread and other ingredients. Rich flavors of smoky meat, mayo and pâté. Crunchy veggies with just the right of acid. Fresh herbs. Sweet and spicy chili. When combined, these bring together an incredible range of flavor profiles. 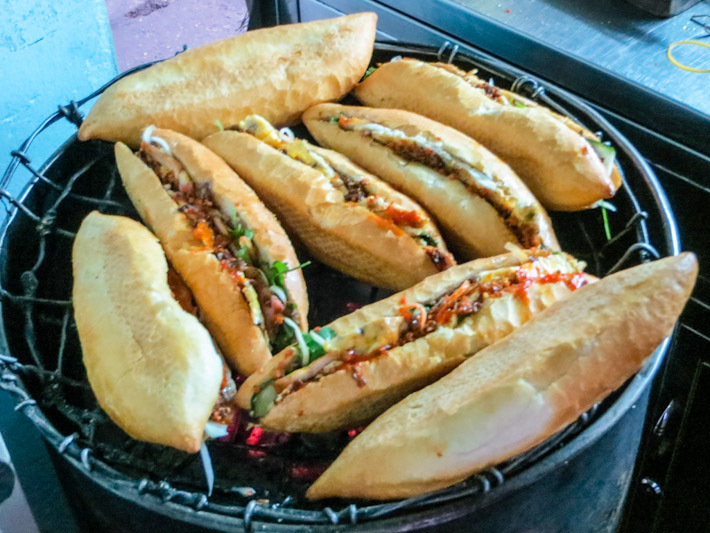 Encapsulated inside the toasted baguette, the bánh mì also brings together crunchiness and delicate roasted meat inside. 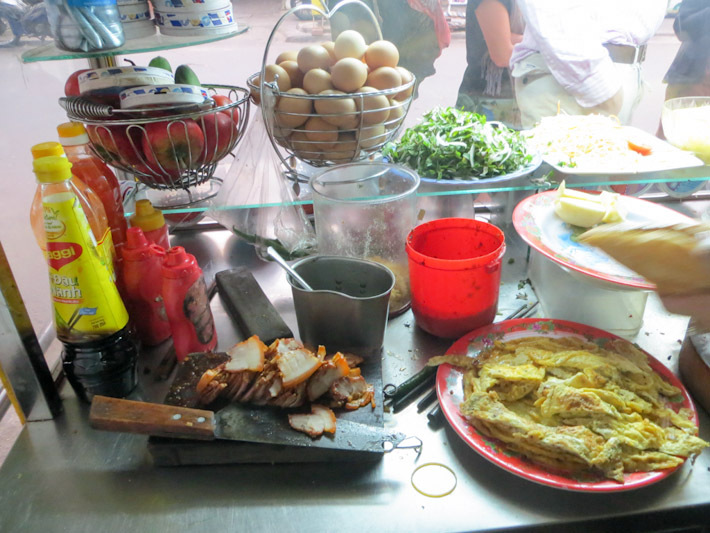 In my opinion, this is not only one of the best foods in Vietnam, it’s one of the greatest in the world. 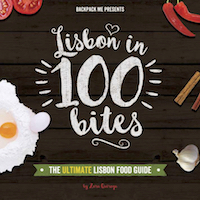 The overall experience of seeing the ingredients, watching it made, and big smiles all around, made for one of the culinary highlights of travel. Do yourself a favor and head to Hoi An sometime and stop by. I’d love to know what you think. Where did you find your favorite sandwich? 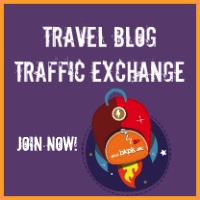 Find more incredible food and travel tips at CamEscapes and join the community on Facebook and Twitter. I also had my best Bahn Mi in Hoi An – at Bahn Mi Phuong. That’s a bit cliched as it’s where Anthony Bourdain featured and claimed it was the best Bahn Mi in Vietnam… but cliche or not, it was damn fine!! I’m going to track down Madam Khanh next time I’m there! That is one tasty looking big sandwich!! !